Like any gardener knows, spring is a busy time. As any parent knows, spring is an insanely hectic time. Now, factor in a nursery business, plus a new garden addition and upcoming garden/farm tour, three kids and their myriad activities, school commitments...and my favorite season is gone in a blink of an eye. Honestly, what happened to April? Helloooo? April? Where did you go? I've been a bit sentimental about the passage of time lately. April is also the birthday month for Chicken Mama and Mikey. Truly, my babies are growing into independent young people too quickly. Just six months ago, Kristen still looked like a little girl, but now she's turned into a pre-teen, with long, long legs and sassy, cute outfits. Plus, of course, she talks about chickens non-stop. I'm hopeful this trait will continue through her teen years, as the incessant chicken-chatter may deter the boys. Honestly. The girl talks about chickens in her sleep. So, because I'm a firm believer in keeping kids busy with their interests so that they can't get into trouble, Chicken Mama is now a member of the 4-H Poultry Project. The 4-H Poultry Project is a terrific program developed for kids to teach them how to raise and care for a small flock of chickens. 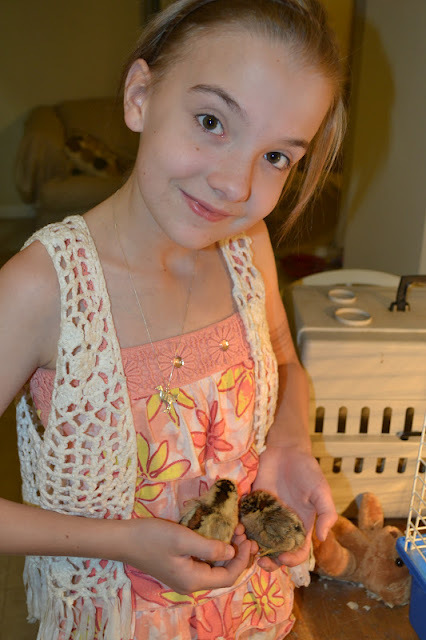 The 4-Hers raise day-old chicks to 24+ weeks for egg production. Then, at the end of the 24-week time period, the student selects his or her best pullet to be shown in competitions. Integral to the program is a project book, where the 4-Her records important information learned while caring for the flock. 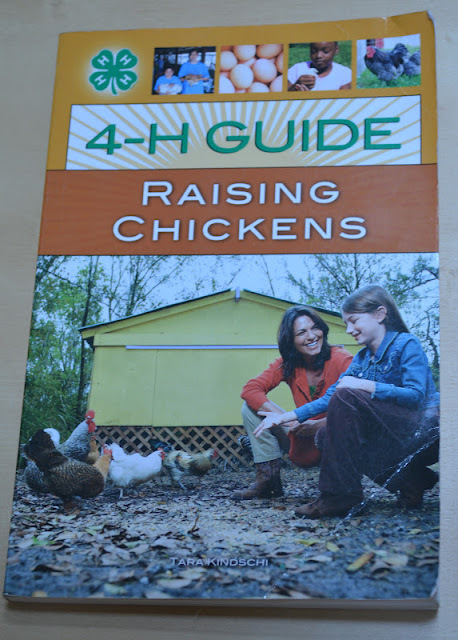 Frankly, I think there should be an adult version of the 4-H program for all of the backyard chicken enthusiasts. While it's easy to impulsively stop in your local feed and seed during “Chick Days” and pick up a few fluffy lovelies, there's much to learn for the first-time chicken-owner. a movie featuring individuals who raise chickens within city limits. My little semi-shy girlie introduced the audience to Saltine, one of her new pullets, and answered questions from chicken-owner wannabes. I was a proud mommy. And—I was amazed at the number of people who turned out to talk chickens! Who knew? Every seat was (eventually) filled. Much like a Toddlers and Tiaras' mother, Kristen is prepping her new babies—Saltine, Sugar and Spice--for shows, one of the primary reasons she wanted to join 4-H. Among the materials she received from Clemson Extension as part of her 4-H kit is a guide to Poultry Showmanship. “What to Expect When You're Expecting” chickens. Also known as “broilers” or “fryers.” Enough said. We don't raise those. Varieties that are good for both egg laying and Sunday dinner. Personally, I adore these fluffy, frilly chickens! Feather pattern, comb types, skin color, plumage—these are the prima donnas of the chicken world, raised for beauty more than practicality. Bantams are about 1/3 the size of a standard chicken and are very popular in this category. Once you determine what type of chicken you want to raise, the varieties are seemingly endless. Do you live in an extremely warm climate? Do you want birds that lay well so you can start a small egg selling business? Are you looking for a sweet pet for the kids? Kristen selected her girls by researching the various breeds she liked, then determining which ones had the attributes she wanted. offered by Mother Earth News? offer small orders due to the popularity of pet chickens. Honestly, can you imagine if one turns out to be a rooster? Your babies' first home is very important. During the chicks' early growth phase, they can't maintain proper body temperature without supplemental heat. They need a place that's warm, secure from drafts and predators. A brooder can be as simple as a cardboard box with a cover and lightbulb. Our brooder is an old dwarf rabbit cage with a heat lamp attached to the top. If your chicks are huddled together close to the light, it's an indication that the brooder isn't warm enough. Likewise, if they are at the far end of the brooder, away from the lamp—they may be too warm. Keep an eye on the temperature and adjust the height of your heat lamp as needed. In addition to the heat lamp, you'll need to cover the entire floor of the brooder with litter, approximately four inches deep. Litter can be wood shavings, sawdust, peanut hulls, or pine straw. We use wood shavings, which then go into the compost pile. Another benefit of chickens—a boost to the compost! ...is all of the time. Make sure your chicks have food and water available at all times. The chick's body is more than 50% water, and it needs water for all body functions. Provide two, one-gallon water fountains for 50 chicks. Keep the water clean at all times. We have a smaller waterer, which is approximately a liter for three chicks—but which is cleaned and filled often. Likewise, chicks grow quickly—and they need continuous access to food. ...the awkward teenage phase, where chickens show their true relationship to dinosaurs. And—that's it! Well, at least for now. You're ready to welcome the arrival of your new babies! For now, enjoy your little peeps. Remember—the more that you handle them, the more tame they will become. Enjoy your babies--they grow so quickly.